Lewis Longhouse | Isle of Lewis Lewis Longhouse, Back, Isle of Lewis. Outer Hebrides. HS2 0LR. 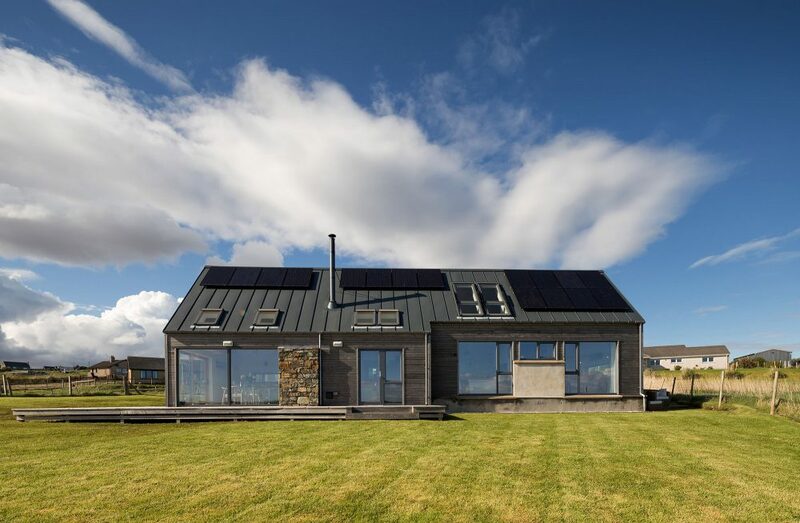 In an idyllic location on the north-east coast of Lewis to explore far and wide, the house is set low on the hillside with wide, uninterrupted views east, south and west. Watch the world go by and weather change throughout the day. Soak up the views through floor-to-ceiling windows south to the bay, from stunning sunrises east over the water to west for sunsets over the moors. This is a substantial and luxurious house designed as a home-from-home with a spacious, double–height living area, two large bedrooms, two bathrooms and a quiet relaxing area upstairs with viewing balcony and office area. Downstairs, the spacious open plan living/dining/kitchen area has large floor to ceiling windows, bringing the outside in, Glass doors open onto a wraparound deck. Bedrooms face south to make the most of the views. The master suite with superking bed has a wet-room style ensuite shower room. The second bedroom (superking or twin) sits across from the bathroom which offers a relaxing bath and separate shower. Underfloor heating keeps oak floors warm underfoot and a multi-fuel stove keeps you cosy whatever the weather. The kitchen area is well stocked, with induction hob, ovens, wine chillers, dishwasher and fridge, making eating in a pleasure. Or, use our dining deck on sunny days! The house also has super-fast broadband, smart TV, Bose system etc. EV chargepoint for electric cars.